I love being in the country. I like imagining idyllic scenes of vast open fields as far as the eye can see, and tall mountain peaks painted against the view of a lazy blue sky with clouds overhead sailing by. There would be different trees and sizes while herds of cattle move along lazily, chewing grass every once in a while. Despite living in the city for most of my life, I like to consider myself as a country girl because of my roots. I guess it shows by how much I dream about being a cowgirl or how I like watching westerns during my spare time. And even if I visit the country only once a year, I can get to keep a piece of it at home with cowhide rugs. Cowhide rugs are perfect for any type of space. I have a friend, Chuck, who told me he had fitted his crowded New York apartment with a gray cowhide rug. I thought it would never work but was pleasantly surprised when I visited him last month that he actually pulled off the look quite well by employing other furniture and fixtures that complemented the western look. It also helps that cowhide rugs remind people of that open country image with endless fields and sloping mountains. It would make anyone think that despite such a constricted space, an open view of the country is waiting right around the corner. That’s how I felt, at least, with Chuck’s modest western set-up. I have to say that his apartment, as a whole, is a haven of pure western genius in the middle of New York’s melting pot of cultures, and I applaud Chuck for that. However, you can’t rule out black and white cowhide rugs in large spaces as well. Wealthy Texans and ranch owners, after all, are bound to have a cowhide rug or two in their large estates. The secret to pulling off the look is really complementing the rug with other western themed pieces to make sure that nothing is out of place. The good thing with cowhide rugs is that it can also fit other specific home themes. Red cowhide rugs go great with modern rooms lined with dark wood paneling and furniture, coupled of course with good lighting and minimalist fixtures. I situated my solid white cowhide rug in the study where everything is covered in white, including the bookshelves, the walls, and my desk. I have a wood panel floor, which goes absolutely great with my cowhide rug as its flecks are of a light brownish color, unlike other that have irregular black spots. 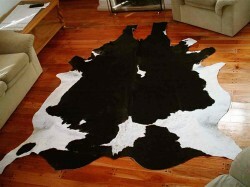 Handsome cowhide rugs are available in Amazon.com, depending on the particular type you need. There are 70% Black and White Cowhide Rugs produced by Home Décor International, which costs around $200 and is treated for home use. Alternatively, there is also a Calf Hide Reddish Brown and White Calfskin, which costs at around $70 dollars, although it is a predominantly brown with white cowhide rug with touches of white on the edges, made from Brazil.